Who Will Face the Music for Iraq’s Future? US President Barack Obama’s August 31 speech, in which he announced the long-awaited drawdown of US combat troops in Iraq in line with his previous statements made all throughout his presidential campaign, came about as a logical outcome of what has been the electoral promise and a great hope. Looking at the poor state of the American economy, which some experts say might finally enter a double-dip recession stage, and assessing the relative unsuccessfulness of America’s attempts to rein in Iraqi instability and Afghan insurgency, one is liable to say that the decision of the US President to reduce America’s involvement in one of the deadliest wars in modern history is well-grounded. Indeed, from the very first day of Operation Iraqi Freedom, which toppled Saddam Hussein’s regime and plunged the whole country into never before seen state of turmoil, the United States has lost more than 4,400 troops, most of whom fell victim to premeditated attacks by local insurgents. According to the majority of expert estimations, the overall military expenditure in Iraq has so far exceeded $700 billion, and this figure keeps on growing, as may be seen from the front page of the Cost of War project launched by the National Priorities Project research organization based in Northampton, Massachusetts. If one conjoins the cost of war effort in Afghanistan, where the United States has recently ramped up its military contingent with part of its 30,000 troops infusion, as if in a way to compensate for then-upcoming and now effective reductions in Iraq, the overall military burden on the American economy will amount to $1 trillion – a real albatross around its neck. The difficulty of calculating the real sum of money that the United States has already spent or is about to spend on its engagement in both conflicts is vividly demonstrated by a renowned economist Joseph Stiglitz, who is a professor at Columbia University. In his article for the Washington Post of March 9, 2008 co-written with Linda Bilmes, he asserted that the net burden might well exceed $3 trillion, given the fact that in order to implement a comprehensive military strategy and to account for its offshoots, which are many in all protracted wars, the US Government had had to resort to tremendous borrowings and is now faced with paying interest on them. One may presume that had not the world financial crisis broken out so vehemently, while the Iraqi and Afghan military endeavors had already been launched, the United States Government would not be hard pressed for accurate calculations and urgent modifications of its strategy based on them. It might have well continued its hazardous journey in the Persian Gulf without paying any serious attention to what some rebel, Joseph Stiglitz, has to say in the press. It is all too clear now that during these last 7 years in which America has been waging its unrelenting war on Iraqi insurgencies, those who lost in this ostensible battle for democracy, where democracy had never thrived, are the Iraqi people. Unlike the situation in the Vietnam War, where the United States came to the water’s edge in its effort to test the policy of containment, so much criticized by Walter Lippmann for its proclivity to overextension and subsequent exhaustion for no palpable gains, neither the White House nor the State Department nor the Department of Defense are assailed in the 7th year of war by as vigorous Peace Movement campaigners as were Lyndon B. Johnson and Richard Nixon at the later stages of the Vietnam debacle. Quite to the contrary, an ever so powerful Tea Party Movement — whose rhetoric may be lacking in substance but is predicated on the belief that America’s strength may be resuscitated even with the war going on — and considerable strands of the Washington-based political establishment think that what has been done so far is not enough. They tend to believe, rather naively, that waging the war to the finish is an attainable goal, despite the visible constraints on the American stamina originating from America’s financial problems. The Obama administration, which associated itself with an aspiration for radical change, but now seems to be fumbling with the legacy of the Bush presidency without actually renouncing it, is caught between the two fires. On the one hand, there is a strong opposition from the Republicans and even more so their Tea Party fellows to a complete winding-down of America’s military engagement in Iraq, as in this case, according to their unscrupulous reasoning, America would foreclose the remnants of its influence in the Persian Gulf, where it still maintains a strategic interest. On the other, and in spite of the absence of an anti-war campaign overtly endangering the presidency, current American leaders, who may be characterized as moderates, may believe that there is a tangible logic to gradually withdraw from Iraq, where American troops have proved to encounter the same quagmire as in Vietnam, now and then in the face of an elusive insurgency avoiding open-field fights, but, for the lack of military superiority or at least relative balance, preferring to fight in unconventional ways. What is interesting about today’s state of affairs with regard to the Iraqi campaign is that the theme of democracy promotion has long been discarded as incompatible with surrounding realities. The war, which started as a crusade against the forces of evil and for the liberation of ordinary Iraqis (who did never ask for it), is now being discussed in terms of the pure and simple national interest of the United States, just as it turned out to be with Richard Nixon’s stated goal of bringing “peace with honor” to Vietnam. This is where all unsuccessful wars end. Whatever the attitudes of hawks and doves in the American political establishment, it will be more and more difficult for US leaders to stay involved in Iraq, as America’s resources are squandered there as mercilessly as nowhere else in the world. The logic will finally prevail and the withdrawal of US military, orchestrated to the drumbeat of the smooth “Iraqization” of the war on terror (another reference to Nixon’s Vietnamization policy), will take place. Those sitting in Washington will then evaluate the losses America has incurred in its struggle against the forces of terrorism and radicalism and deplore the vistas it has never seen open up during its prolonged stay on foreign soil. The future generations of American politicians are most likely to blame the useless war effort and its futile spending on both George W. Bush and Barack Obama, as the first embarked on a morally unjustifiable course and the second will soon be led not to stay it, however rational his calculations may be in this regard. For the latter, his presidency will still be largely associated with a lost military campaign, unnecessary killings and devastated lives. Yet, this blame-game scenario can be delayed if Barack Obama sees to it that the withdrawal dilemma shall be passed to his successors, in order to avoid the same accusations that Mikhail Gorbachev has been facing since 1991, when he purportedly ruined the Soviet might, which was already a dead myth encapsulated in a still shining flesh. Anyway, the Iraq war will be deemed, in the eyes of cold-blooded American foreign-policy experts, a failure and one of the silliest unilateral undertakings since the “unipolar moment” was hailed by Charles Krauthammer back in 1990. This probable outcome notwithstanding, the United States will not cease to play the role it has been playing ever since its ascendancy to the world stage as a post-Cold War super power with unlimited room for action. Only in this case, it will have to shorten its global wish list and to confine it to some doable and profitable enterprises, without retreating into isolation. But as we look half a world to the east, to where today’s Iraq is, who will face the music there for all the bad things it has known both from Americans and savage radicals? The only probable answer is Iraqis themselves. It is even more difficult to estimate how many civilian Iraqis have died in the conflict, than how much the US army has invested into their “protection”. The Iraq Body Count project, a largely conservative enterprise, reports to date from 97,000 to 106,000 civilian deaths since 2003, whereas the second Lancet survey published on October, 29 2006 estimates that the number of excess deaths caused by the Iraq war amounted to more than 650,000 cases in three and a half years’ span from 2003 to 2006. One may even assume that this figure is higher, given the complexities of body count procedures in the place of ongoing hostilities. Despite all these uncertainties, the Lancet surveys and the Iraqi Family Health Survey are the only peer-reviewed publications out of all Iraqi casualty estimates so far, which gives them bigger credit for accuracy. Millions in Iraq have become homeless, infrastructure has been and is now being crippled, and the central government headed by Prime minister Nouri al-Maliki looks feckless and incapable of ensuring minimal security and sufficient political control. Instead of bringing home to ordinary Iraqis and their rulers that to live in a democracy is better than to suffer under dictatorship, the United States has substituted sheer chaos for the heavy-handed oppressive regime of Saddam Hussein, who, though he oppressed freedom and persecuted any heresy, had not possessed weapons of mass destruction and was not threatening anyone anymore, other than his own people. One may long argue whether the city-on-the-hill concept of American exceptionalism permits to interfere with a sovereign state’s affairs to make its people happier and its statesmen comply with the universal law, but what is evident from the Vietnamese and Iraqi experiences is that to interfere without knowing local specifics or ever inquiring about local people’s wish to carry out a forcible change is a huge mistake. As George Santayana once put it, “those who cannot remember the past are condemned to repeat it”. 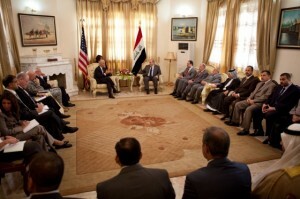 The US Government has staked the success of its “stabilization” of Iraq on the compromise figure of al-Maliki just as it did the same with respect to South Vietnam’s ruler Ngo Dinh Diem, who was finally overthrown and killed in a 1963 CIA-sponsored coup after he had evidently failed to implement democratic reform in a country which had not lived under democracy any time before. Similarities are legion, differences are as many. But the outcome may be the same. If the United States finally withdraws — and it has no other option at hand, which means that withdrawal is inevitable — Iraq, or rather what is left of it, will have to cope by itself with its weakened security at borders and on its territory. Engulfed in an endless internal strife among various ethnic and religious groups, and confronted with the task of fighting renewed crime waves taking strength amid disorder and instability, the country whose utmost importance is its location in the Persian Gulf is likely to shift from one chaos to another. The United States’ capacity to control the chaos that its own military produced by its reckless and irresponsible interference in Iraq is limited if not fictitious. Chaos engenders even more chaos, which means that Iraq’s fate may become similar to that of South Vietnam which buckled under the weight of the North Vietnamese communist drive in 1975, two years after the Paris Peace Accords were signed and America disengaged. This time, the overwhelming force may prove to be Iraqi insurgency, and behind its back, all those subterranean forces which benefit from regional instability and base their criminal ideologies on the weaknesses of traditional state structures. America has to some degree helped those forces reach their goals, as it eliminated Iraq’s only regime, however oppressive it may have been, from the face of earth, substituting chaos for dictatorship and complete disarray for the hard-faced rule. Far from defending Saddam Hussein, whose new lease on life could not have been justified on the basis of all his crimes, one might rhetorically ask whether Iraq would be suffering that much had the 2003 invasion not occurred. The answer is on the surface: the deadly total of more than half a million civilians is a hard price to pay for the empty promise of democracy in the land of eternal hardship. More information about Operation Iraqi Freedom may be retrieved from the iCasualties website at: http://icasualties.org/Iraq/index.aspx. The total expenditure count may be found at: http://www.costofwar.com/, whereas a detailed breakdown of military costs in Iraq and Afghanistan per fiscal year may be consulted at: http://www.nationalpriorities.org/costofwar_home. Please visit http://www.iraqbodycount.org/ to get familiarized with the project’s team, rationale and methods of analysis.